Rinse and drain quinoa and bulgar. Heat 2 teaspoons oil in a large saucepan over medium-high heat. Add shallots to pan; sauté 2 minutes or until tender. Add water, broth, and salt to pan; bring to a boil. Add quinoa and bulgar; cover, reduce heat, and simmer 15 minutes or until liquid is absorbed and grains are tender. Remove from heat; set aside, and cool slightly. Combine remaining 2 tablespoons olive oil, lemon juice, and pepper in a large bowl; stir with a whisk. 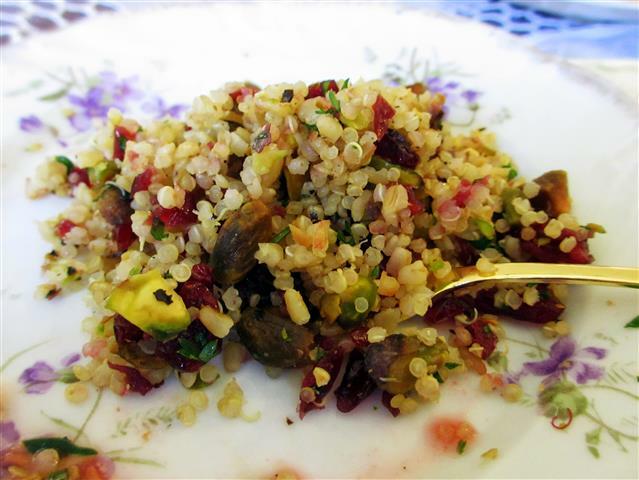 Add quinoa, cranberries, and remaining ingredients; toss gently to combine.